This exhibition is dedicated to the contemporary Swedish design of indoor luminaires. The exhibits displayed are designed by Jonas Wagell, Åsa Lockner, Louise Hederström, Helena Svensson, Malin Sköld, David Taylor, Marie-Louise Gustafsson, Form Us With Love, Jens Fager, Thomas Bernstrand, Mattias Ståhlbom, Aleksandra Stratimirovic, Jan Ejhed, Camilla Diedrich, Anders Pehrson, Christian Andreason, Kristin Leibel and Olle Lundberg. The exhibition presents products of the leading Swedish companies, manufacturers of contemporary modern and functional lighting; Bsweden, Ateljé Lyktan, Annell Ljus+Form, Design House Stockholm and Zero. The exhibition is collated by Aleksandra Stratimirovic. Exhibition’s graphic identity is signed by JobbaJobba from Stockholm. Brilliant! 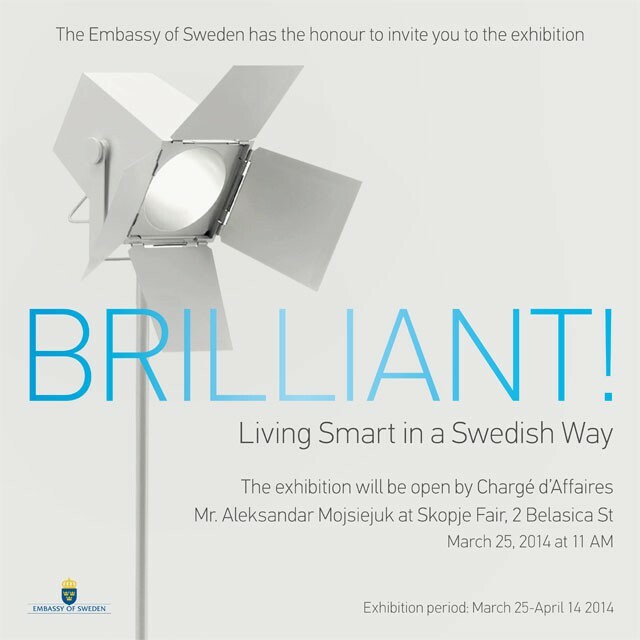 was initiated by the Embassy of Sweden in Sarajevo and shown at the Bela Vida Gallery from 9 December 2013 to 5 February 2014. During March 25 until April 14 exhibition was shown at the Skopje Fair, Macedonia, supported by the Embassy of Sweden in Skopje and in collaboration with the Skopje Design Week.